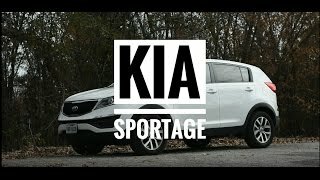 Sportage isn’t a model who a recently stepped in the automotive market, but it’s one coming from time when Kia was Hyundai. Giving redesign to its one of the oldest lineup, company recently unveiled Kia Sportage 2014. With its sales continuously rising, company too keeps major concentration upon bringing something new for its buyers. 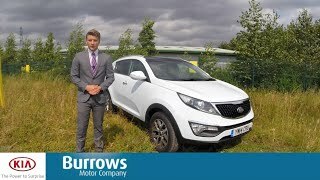 Let us have a look at the Kia Sportage 2014 review to see what’s new for this model. The interior of Kia Sportage 2014 looks classy with the ‘nano’ paint finish over dash and center console and the upper door trims adored with soft touch materials. Sitting over leather upholstered six-way adjustable seat, you’ll have to grab the heated steering wheel. Talking about the technological advancements you’ll have a 4.2 inch TFT LCD creating the dual bezel instrument cluster featuring information like, outdoor temperature, Flex Steer modes, gear shift and Parallel Park assist. Not only will this a few models have a seven-inch color touchscreen for satellite navigation with mapping for 44 European countries. To enrich your entertainment segment, interior of Kia Sportage 2014 for the first time comes with Infinity premium audio system. A total of seven speakers come mounted inside the model including a subwoofer which makes the entire experience thunderous and enchanting. 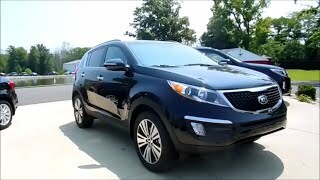 The exterior of Kia Sportage 2014 looks gorgeous and easily grabs the attention of people passing by. Starting with the front fascia, tiger-nose grille gets the blend of central radiator mesh design and looks stunning sitting amidst the enhanced headlights with better illumination. Having HID headlights make the model walk closer to its rivals. There is also a backup camera to assist driver while taking reverse gears. Front looks aggressive with its fog lamps incorporated in bumper and sleek horizontal air vent in center. Marching towards the rear profile, the window mounted at back might feel small like in ancestor models but we believe the presence of rear view mirror won’t let it bother much. Apart from this looking at the exterior of Kia Sportage 2014 from back looks very much similar to its ancestors. Rounding up the entire details we can say that the new model has a bit more of aggression while rolling over 17-inch wheels. 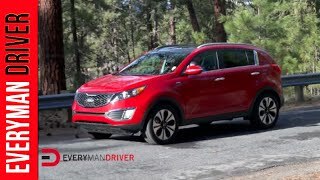 The Kia Sportage 2014 now brings four powertrain options with it namely, 1.6 GDi, 1.7 CRDi, 2.0 CRDi and 2.0 CRDi generating total output of 133 hp, 114 hp, 34 hp and 181 hp and peak torque of 165 nm, 260 nm, 320 nm and 383 nm respectively. While each of the powertrains comes paired to six-speed manual transmission, latter two brings six-speed automatic as an option. 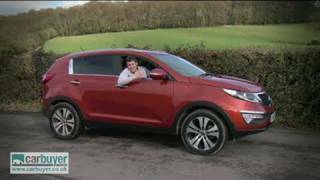 Top Speed of Kia Sportage 2014 powertrains touches mark of 111 mph, 107 mph, 112 mph and 120 mph respectively.